Our company operates in Faro Airport since 1966 focused on private airport transfers. We provide direct transfers from Faro Airport to any hotel, resort, holiday villa or local in Carvoeiro area. If you are not sure about your destination, contact us or ask for a quote, we will help you find the best answer to your question. Let our experienced drivers guide you to your final destination in the Algarve. 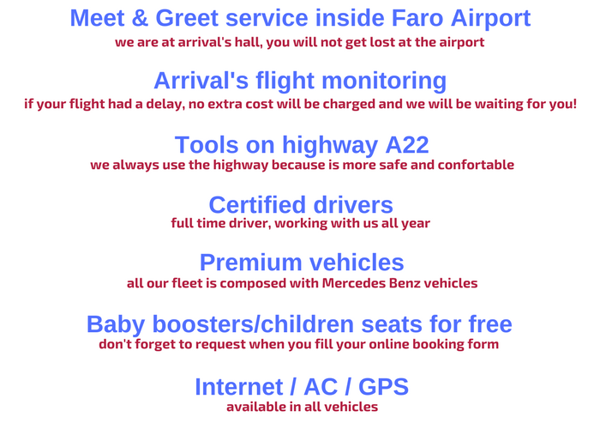 Our driver will welcome you at Faro Airport arrivals terminal, with no wait in queues, he will provide luggage assistance and lead you to your assigned transfer vehicle. Taxi Transfer Pinheiro, has refined since 1966, to provide you a service driven by courtesy, a journey with comfort and safety in premium vehicles. That’s why we are in the transfers business since 1966 in Faro Airport. In 24 hours you will receive, by email, the confirmation document with the details of the reserved service and some useful information (how to get to the place of our reception service at Faro Airport, emergency number, among others). A copy of the reservation form is sent to your email address. IMPORTANT: If you do not receive a copy of the reservation form, please check the spam folder. Please be aware that if this happens, the same may happen with our message with the reservation confirmation document (contact us at info@taxipinheiro.com). Some Hotels and Resorts available in Carvoeiro area. 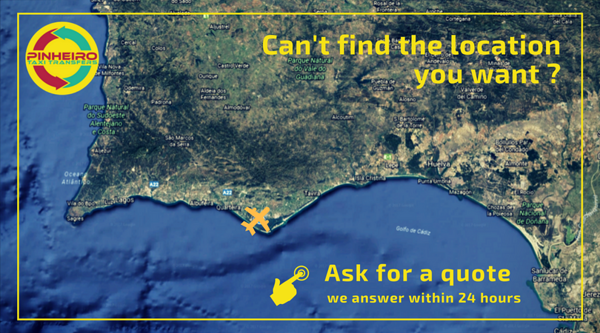 If you are no sure about your destination, contact us or ask for a quote, we will help you find the best answer to your question. Carvoeiro, or more commonly Praia de Carvoeiro (means Carvoeiro Beach), formed from a picturesque fishing village, with a long history of settlement. There are vestiges of human settlement dating to the Roman occupation of the peninsula, as well as early naval activity in the area. Praia de Carvoeiro has developed into a tourist area due to its number of sand beaches protected by cliffs. Now, you can find a great touristic offer with many 4/5 star hotels and top restaurantes. There are amazing beaches in Carvoeiro, to choose one is difficult, but you can be sure that you will have great lazy days in any of these Carvoeiro beaches. Usually the most spoken beaches at Carvoeiro area are the Praia do Carvoeiro or Carvoeiro 'town beach' as it also known and you will understand - see the picture in the top of this page, the Praia do Paraíso (Paraiso Beach) very close to Carvoeiro, the lovely curved sheltered bay of Praia do Carvalho (Carvalho Beach), the Praia da Marinha (Marinha Beach) where you can choose among several little bays at low tide or the spectacular cliffs of Vale de Centeanes Beach.